I am not entirely sure about moderators, but I know that admins can select the best answer in threads where the OP doesn't select it. This is something that I will occasionally do, if I see that a thread has been without reply for a week or so, I'll then select a best answer to assist those who come to the thread in future. Which makes it sound like it is not actually TSO'd (although I can't tell for sure from this info). It sounds like they used the TSO list of requirements, and did drop tests etc. to satisfy Australian requirements. That could be reassuring to an Australian customer. BUT... the gear wasn't actually entered into the US TSO system. Nor is there any sign that an Australian part 103.18 certification is automatically accepted as equivalent to a TSO by the US. Then you get into the issue, "But what if one is talking about a PA rig that was a license built copy of a US TSO'd Rigging Innovations rig?" That's certainly worth something to a jumper, but if it isn't actually produced in a TSO approved production facility, then it still can't count as having a TSO even if the design is TSO'd. (As a similar example, for one Canadian rig that was TSO'd, it was done through Transport Canada according to bilateral agreements with the FAA, so the FAA accepts it. So it has a real FAA TSO. Then the production plans and facility were approved & inspected so that it was run on a TSO approved production line. Years later, the company owner gave up the formal TSO certification as he wasn't selling many to the US anyway, so it wasn't worth the money to pay for the inspections the Canadian authorities were doing for the production line. A jumper can be reassured that the design actually went through all TSO tests which were accepted by the US, even if a current production rig doesn't actually have a TSO. An earlier rig could be jumped by a US resident, but the current ones can't.) Correct me if I'm wrong about TSO'd production lines -- I'm a bit hazy on that aspect and what formal terminology applies. yep. Years ago, for a customer who needed mid-season service. Probably the wrong place for this, but no account I have read anywhere mentioned someone who elected not to jump? Three jumpers were pulled off the load because of weight issues. How much can you lengthena harness? It's very difficult to give you a good answer based on height differences alone. The easiest way to get a good answer is to go to the manufacturer's site, go to the 'how to measure' page and get yourself measured. Don't try to do it yourself. A rigger or tailor is your best bet, but the reality is that anyone who can read a tape measure and follow directions can do it adequately. Then take those measurements and the serial number of the prospective rig. Send those to the manufacturer and ask them. Hey everyone, my darling wife bought me a tandem jump for my birthday this past January and one for herself essentially for our anniversary. Our anniversary happens to be the day after my birthday, so it is a little bittersweet for me in a way lol. So now we celebrate a "birthaversary". Back to the story, she bought the tickets to go to Skydive Spaceland here in Houston for this past Friday. Had to get a rain check due to fog and overcast that would not let up. 1hr 20 min drive each way. So Saturday we drop the children off with the in-laws and head back down to the DZ because the weather was clearing up nicely. Got all checked in, suited and geared up, and waited for the next plane to go up. Wasn't nervous at all, just an odd thought in my mind that once I got into the plane I knew I wasn't getting out of it on the ground like a typical flight for work haha. We fly up to about 13.5-14,000ish and the plane levelled off and slowed down, keep in mind this is new to me. Typical plane rides don't really level off and slow down like that, it was a mild oh crap here we go moment in the back of my mind that brought a smile to my face. Door opens and the solo divers all jump, then the camera man that jumped with my wife and her tandem instructor, then myself. I got to the edge of the door, looked down, smiled and we rolled out. 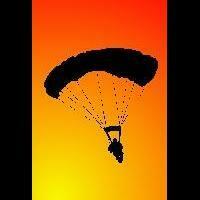 I couldn't believe after leaving the plane how calm and relaxed I was freefalling towards the ground. No screaming or shouts of joy or anything...am I broken? lol we reached 7,000 ft locked on to the altimeter til 6 and pulled. It was at this moment that I started laughing when we started doing controlled turns and spiraling left and right, ok maybe I am not broken? We fly in the holding area for a bit then come in for landing and stick the landing. No sliding in or running like a madman. Just a nice buttery landing on our feet. Go inside and take care of the log book and walk to the smoking area to have a cigarette, and that was when the adrenaline kicked in. OK maybe I am broken, I mean delayed reaction much? Anyway, my wife comes out to me and is like we should do the second jump. I think to myself we are already here why not? I say to her lets do it. I paid, but we couldn't get onto the last flight due to a totally awesome memorial jump for one of their people that had passed due to illness. My hats off to that BTW. We went back first thing Sunday morning and got logged in and on the first flight up. Make an already long story short, had more stuff to do during freefall and we had another butter landing. Now it is safe to say that my wife an I are officially hooked, just need more money LOL. Her grand idea/plan is we should both get our solo license, so on our "birthaversary" we can both solo together, rather than doing tandem jumps. I like the idea, but money especially for 2 people to try to do at least 2 jumps a month would be really tight. I gotta give it to her though, in my early 20's I kept saying with "friends" we would go do it, but it would never happen. Everyone was always more interested in drinking and nightlife. Now I am 32 (not claiming to be old) and have yet another expensive hobby x2. If it wasn't for her I probably wouldn't know what it is like because it had fallen off of my priority list of things to do for fun. Anyway now I am interested in pursuing this and will be looking around the forum for next steps to take other than the class and jumps, more like when to buy gear and what to buy like should I bother with my own student canister or not. stuff like that. I have jumped a Batwing 153 over 4500 jumps, mostly video, AFF and Records. Love it! See no reason to change to "keep up with the Jones's"